Benedict was born in the small town of Norcia around 480 AD , in a particularly difficult period of history . Four years earlier ( 476 ) was formally ended the Roman Empire of the West with the last emperor Romulus Augustus . It was a contemporary of Theodoric and saw the ambitious project, fail in blood, of peaceful coexistence with the Goths and the Romans ; He witness the horrors of the terrible war between the Goths and Byzantines for the dominance of Italy ( 535-553 ) , the war that left desolate and depopulated our country between massacres and plagues . It was also a contemporary of Justinian . After an experience of a hermit for three years , he founded a group of small monasteries in Subiaco , where he began the revival of monastic life and of the Church . There were many who followed him . Among them were young Roman aristocracy , as Mauro and Placido sons of senators , but also the Goths and the sons of slaves , humble and rough : for all Benedict was the master in the " school of divine service "( this is the definition he gives the monastery in his Rule) . So Benedict laid the foundations of a unity between barbarians and Latin very profound , because it is based on universal brotherhood taught by the Gospel . He went away from Subiaco , Benedict headed to Cassino , on the high ground where he founded , in 529 , the monastery of Monte Cassino to become the most famous in Europe . His death took place there , between 543 and 555 AD, a date that the ancient tradition has fixed March 21 . Become the symbol of the monastic ideal , was spontaneously attributed to him about everything that monasticism , including pre - Benedictine and extra - Benedictine had done in the service of civilization. In 1947 , Pope Pius XII named him " Father of Europe " and October 24, 1964 , coinciding with the consecration of the Basilica of Montecassino , which was rebuilt after the destruction of World War II , Paul VI proclaimed him " Patron of Europe "
His memory , because of Lent , was transferred from the traditional date of March 21 , believed to be the day of his death , to 11 July , the day since the early Middle Ages in some places it was a special remembrance of the saint . 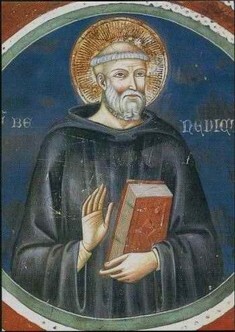 St. Benedict of Norcia , a fresco of the XII century . His Rule , opens a new path to European civilization after the decline of the Roman one . In this school of the Lord's service they play a decisive role the meditative reading of the word of God and liturgical praise , alternating with the pace of the work in an intense atmosphere of fraternal love and mutual service . In the wake of St. Benedict were built on the European continent and in the islands , centers of prayer , of culture , of human promotion , of hospitality for the poor and pilgrims . St. Benedict , like all monks before and after him , abandoned their land to move in search of a bigger and spiritual homeland that is not identified with any earthly society , but that is built inside , in the depths of his own soul and in closed cloistered life . St. Benedict is above all a father of ascetic life , a legislator of monastic discipline that has not given up anything in the great ideals of Eastern monasticism in the fact of loneliness and abandonment of the world. His rule is addressed to monks , to individuals that live separated from society and must not act directly on it because most are and remain simple laymen . The community to which St. Benedict looks is an image of the Church in its most pure and highest - prayer and charity - the practical implementation and anticipated by a return to God , to the fullness of grace ,at the end of time , will be the heritage of the whole community of the faithful .